At my house, we're not too big on sweets. We like to bake because it's so much fun, and we eat the occasional treat, but overall we're sort of sugar wasters. I just recently tossed my son's leftover Halloween candy because he won't finish it (yes, in April) and I don't think we've ever eaten our way through an entire batch of cookies or a cake. We're simply stuck on natural treats like oranges, grapes and apples. That said, we may have just met our sweet soul mate - creamy delicious organic lemon bars. Actually, "delicious" sort of undermines the recipe, because, although surprisingly simple, these are the best dessert bars I've ever had. They're so yummy in fact, that it's unlikely I'll make them again soon, because you can't eat just one. My household ate the whole darn pan in under a week - a record for us. 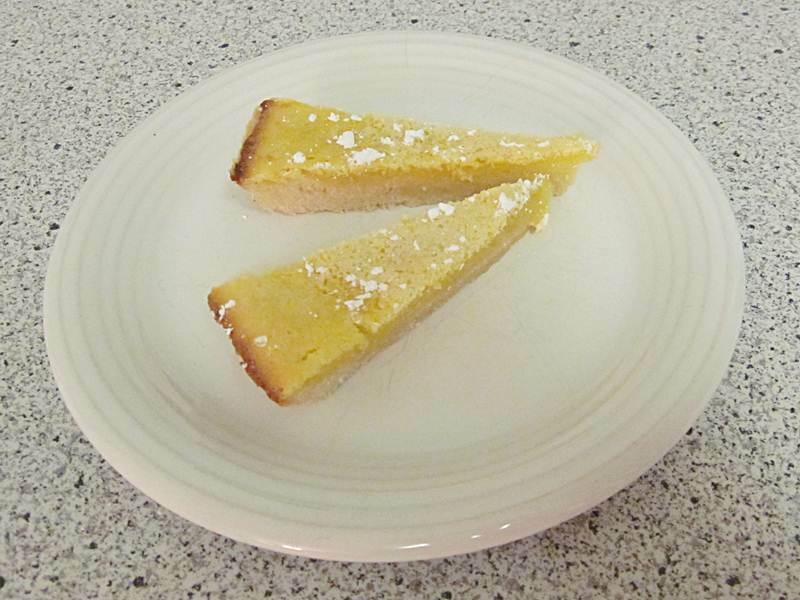 If you do dare to make these lemony bars, now is the perfect time, as they make an excellent light spring or summer dessert (just 97 calories per bar - with 20 bars). Plus, even if you're dead busy, these bars have almost zero prep time and can be whipped up super fast. 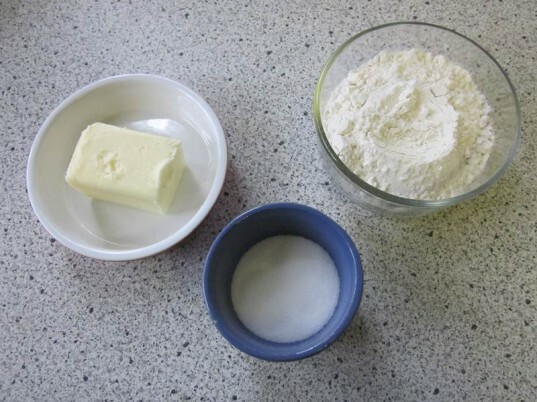 Gather up 1/3 cup softened organic butter, 1/4 cup organic white sugar and 1 cup organic white flour. Beat your organic butter until it’s nice and creamy, then add the organic white sugar and mix again until well combined. 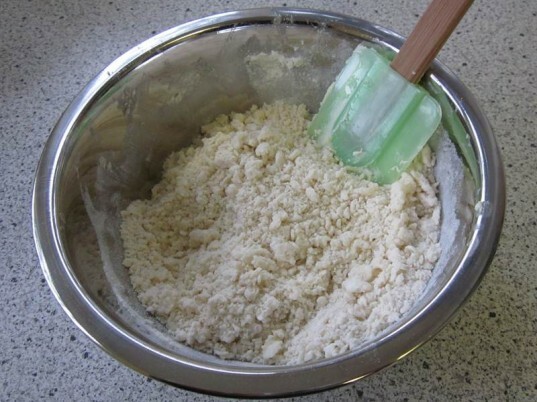 Cut in the organic white flour until the mixture looks crumbly. Your mixture should look like the picture above – crumbly, but don’t take your time making it perfectly pea sized or anything. So long as the mixture is slightly sticking together, it’s fine. Press this mixture into an 8x8x2 pan and bake for 15 minutes on 350 degrees. Note: I didn’t have an 8x8x2 pan so I used a pie plate and it worked out great. You can experiment with pan sizes. For example, I just got some adorable little china white personal pie plates and this dessert would be so cute in them. When I make them again, I’m using the little plates. While your crust bakes, mix 2 organic eggs, 3/4 cup organic white sugar, 2 tablespoons organic white flour, 3 teaspoons finely grated organic lemon peel, 4 tablespoons organic lemon juice and 1/4 teaspoon baking powder together with a whisk. Check on your crust. If it’s starting to brown at all, take it out of the oven. The crust should be a lovely creamy yellow-white color, not a baked brown. 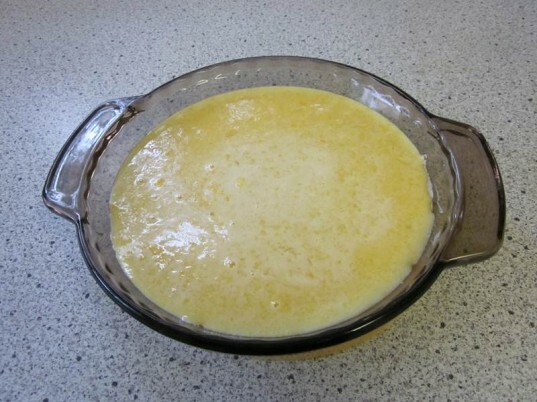 Pour your lemon filling over the already baked crust and bake for another 20 minutes until the edges are lightly brown and the middle is just set – by just set, I mean it may look a little wobbly, like gelatin. Cool your bars for a bit, and then if you want, sift a bit of powdered organic sugar on top. Cut, serve and enjoy. 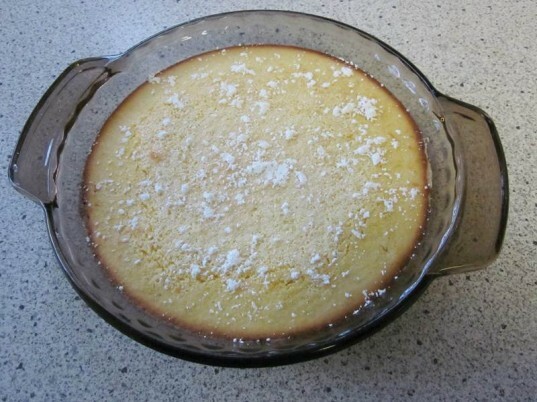 This recipe is supposed to make 20 lemon bars, but due to the round pan we used, we ended up with fewer bars. My son liked these bars almost as much as I did, but he did say he thought they were a little too tart. I disagreed. I felt they were perfectly lemony sweet and not too tart in the least. However, if you like a bit less tartness, simply reduce your lemon juice and lemon rind content a little. Gather up 1/3 cup softened organic butter, 1/4 cup organic white sugar and 1 cup organic white flour. Beat your organic butter until it's nice and creamy, then add the organic white sugar and mix again until well combined. Cut in the organic white flour until the mixture looks crumbly. Your mixture should look like the picture above - crumbly, but don't take your time making it perfectly pea sized or anything. So long as the mixture is slightly sticking together, it's fine. Press this mixture into an 8x8x2 pan and bake for 15 minutes on 350 degrees. Note: I didn't have an 8x8x2 pan so I used a pie plate and it worked out great. You can experiment with pan sizes. For example, I just got some adorable little china white personal pie plates and this dessert would be so cute in them. When I make them again, I'm using the little plates. 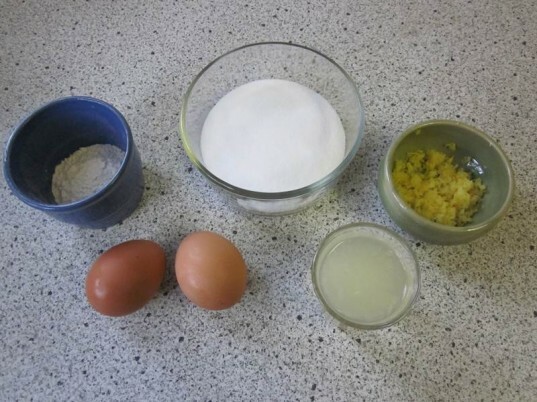 While your crust bakes, mix 2 organic eggs, 3/4 cup organic white sugar, 2 tablespoons organic white flour, 3 teaspoons finely grated organic lemon peel, 4 tablespoons organic lemon juice and 1/4 teaspoon baking powder together with a whisk. Check on your crust. If it's starting to brown at all, take it out of the oven. The crust should be a lovely creamy yellow-white color, not a baked brown. Pour your lemon filling over the already baked crust and bake for another 20 minutes until the edges are lightly brown and the middle is just set - by just set, I mean it may look a little wobbly, like gelatin.